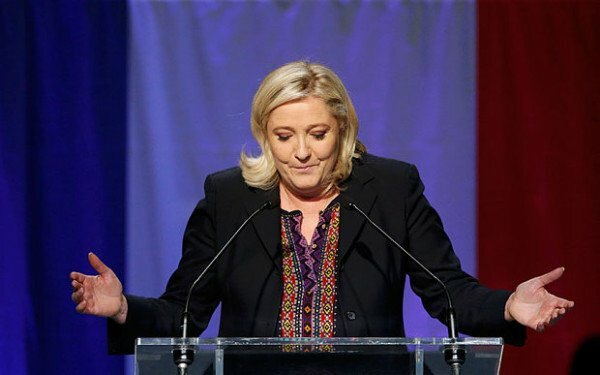 Marine Le Pen’s far-right Front National (National Front) has failed to win a single region in the second round of elections, exit polls indicate. According to early, the FN has been beaten into third place, despite leading in six of 13 regions in the first round of votes a week ago. The polls predict Nicolas Sarkozy’s centre-right Republicans will win most seats ahead of the ruling Socialists. Acknowledging defeat, Marine Le Pen pledged to keep fighting. She blamed the outcome on the mainstream parties which joined forces to keep the FN from power, telling her supporters they had been “disenfranchised in the most indecent of ways by a campaign of lies and disinformation”. Marine Le Pen stood as a candidate in the northern region of Nord-Pas-de-Calais-Picardie. Her niece Marion Marechal-Le Pen was standing in Provence-Alpes-Cote d’Azur, in the south. After both secured more than 40% of the vote in the first round, the trailing Socialist candidates in those regions pulled out so their voters could support the Republican candidate against the FN for the second round. One poll suggested Marine Le Pen had secured 42.5% in the second round in her region, against the centre-right’s 57.5%. Socialist Prime Minister Manuel Valls was less upbeat. He warned the “danger posed by the far right has not gone away, far from it”. Nicolas Sarkozy said now was the time “for in-depth debates about what worries the French”, noting security concerns, unemployment and frustration with the EU. These elections were to vote for councils and presidents of the 13 French regions, which have wide powers over local transport, education and economic development. French media are predicting that the Republicans have taken seven regions and the Socialists five, with nationalists winning Corsica. Official results are expected early on December 14. The first round of voting on December 6 gave the FN the best election results in its history. It was the first electoral test since last month’s Paris attacks claimed by ISIS, in which 130 people were killed. In the lead-up to the first round, opinion polls suggested that the popularity of the anti-immigration, anti-EU FN had increased since the deadly attacks. The FN had been hoping a strong performance would boost Marine Le Pen’s chances for the 2017 presidential election.